Congratulations to Tropa 98 UCU NL from Pangasinan for breezing through a challenging obstacle course in only six minutes and six seconds. 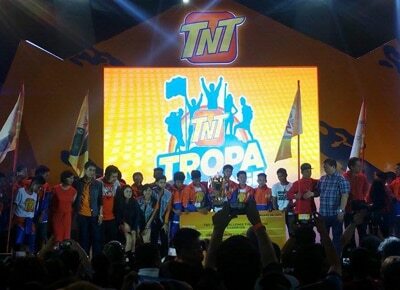 Real tropas can overcome any obstacle– this is what TNT Tropa Challenge was able to prove in its adrenaline-charged and star-studded finals last Sunday, February 26 at the SM Mall of Asia Music Hall. From over 200 aspiring tropa participants from all over the country, the top 18 tropas went head to head in the semifinal rounds, with only the top five teams advancing to the grand finals for a shot at winning over P1 million grand prize plus P100,000 for their school. Relying on team work and strategy, Team 98 UCU NL from Urdaneta City University in Pangasinan breezed through the American Ninja Warrior-inspired obstacle course in only six minutes and six seconds.– from downing exotic dishes at the Gastronomic Challenge; working as one for the Unity Walk; Table Maze, and Giant Puzzle; to showing their might at the Jousting Challenge, Rope Swing, Army Climb and Lateral Climb stations, among others. Meanwhile, Pasig City-based Tropang Thuggerz clocked in at six minutes and 50 seconds for a first runner-up finish, winning P200,000.00 and P75,000.00 for their team and school, respectively. Second runner-up Happy Lang Squad from Bacolod City National High School finished in seven minutes and 22 seconds to take home P100,000.00 for their team and P50,000.00 for their school. The third and fourth placers, Boys Over Wall from Cavite (13 minutes and 38 seconds) and Bomb Squad from Muntinlupa (22 minutes and 42 seconds) each got P50,000.00 cash and P25,000.00 for their schools. Indeed, everyone was a winner including the thousands of subscribers and supporters which enjoyed performances from the Teen Tropa, Jhonng Hilario, VMiguel Gonzales, Hashtags, Loisa Andalio, Sue Ramirez, JC Santos, Hashtags and Rocksteddy during the two-day finale. Will there be a second season? Tropas should stay tuned.